Jose, from Arizona, born in Mexico. The United States is the only country I’ve ever known, and yet, I can’t consider it home. A country that won’t consider me a citizen, that won’t welcome me, can’t be my home — not fully, at least. I was only two when I came to the States. My mom, pregnant and sixteen at the time, crossed the border with my biological dad, who was in his early twenties. From an early age — they both worked hard jobs, not intended for teenagers. But, they needed to support their families. Then, my dad was deported. Back in Mexico, he decided to cut all ties with me, my sister, and my mom. Thankfully, my mom met my stepdad soon after and had my little brother. They’re both undocumented and have no high school education. Because of their status, they don’t have access to many of the opportunities America offers, so for the past ten years, they’ve both worked two jobs to provide us with a better life and childhood than they had. They showed me the value of hard work and how to be the man I am today. There were nights I would stay up late, especially after my dad was deported, worried that my mom and stepdad wouldn’t come home. And some nights they wouldn’t — not because of deportation, but rather due to late shifts and multiple jobs. I took care of my two siblings while they worked, and I learned to deal with problems on my own. But, overall, my childhood seemed normal, and I can’t remember an ‘adjustment period’ to the States. It wasn’t until I was sixteen that I started to realize the weight of the word “undocumented” – I couldn’t drive, work, or easily apply to college. The basketball courts were the only place I felt a peace of mind –I could forget the obstacles and just focus on the game. Off the courts, I felt suppressed and depressed, all because I was born on the wrong side of a wall. I was forced to adjust to these handicaps and to work harder to achieve my dreams. My senior year of high school, I had a 3.5 GPA but no affordable college options – I wasn’t eligible for federal aid, and I couldn’t feasibly work my way through college. My options were slim, until I heard of TheDream.US. The scholarship was my only hope for higher education. 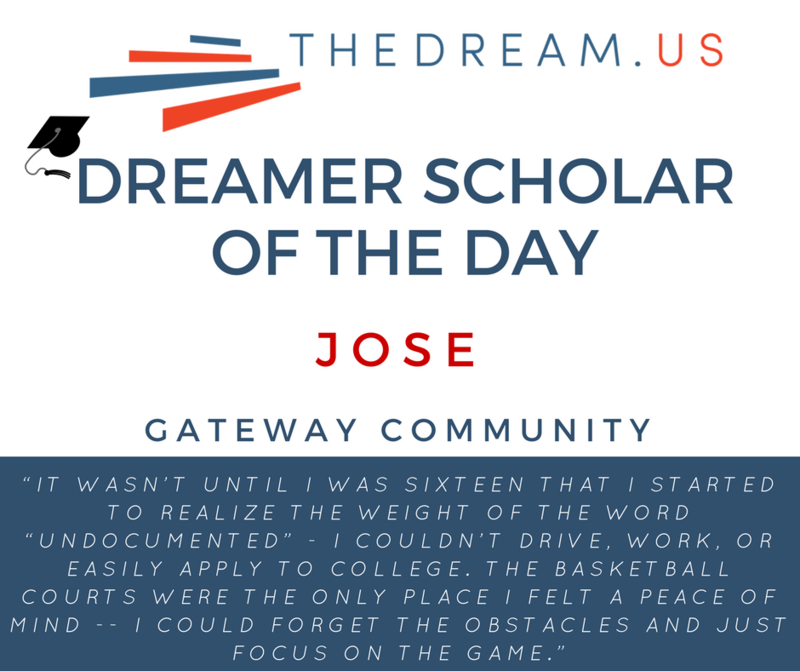 Now, as the son of undocumented immigrants I am a first-generation high school graduate and, with the support of TheDream.US scholarship, a first-generation college student. In college, I plan to study psychology, and hope to become a child psychologist so I can help those in need — I want to be remembered as someone who impacted lives for the better. We are called DREAMers because we dream of having the same opportunities as everyone else. Access to higher education brings us one step closer to realizing that dream and allows us to help change the world and make this country even greater. We only seek equality, why take it from us?